The Razer DeathAdder is renowned the world over for its ergonomic shape, its high-end sensor, its light weight. 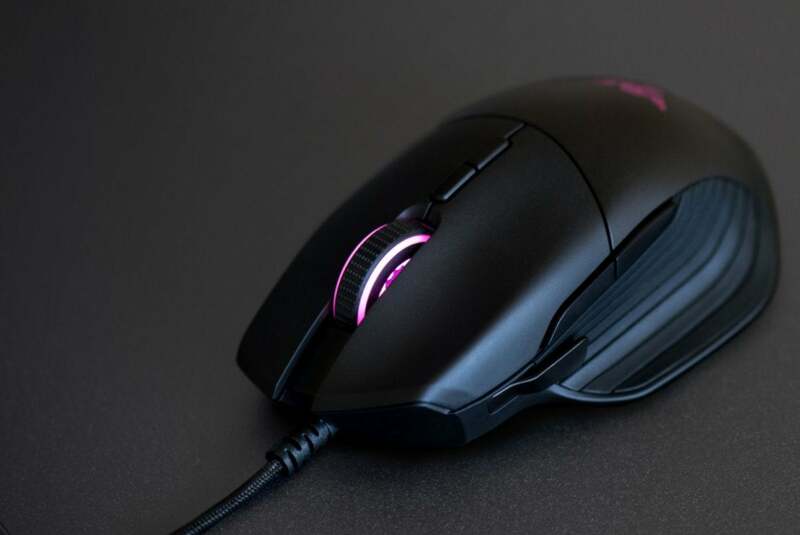 For many first-person shooter fans in particular, it’s the mouse, the perfect way for them to communicate sweeping hand movements into game-winning feats of excellence. So when Razer announces it’s created “the world’s most advanced FPS gaming mouse”—wait, it’s not a new DeathAdder? Well then. 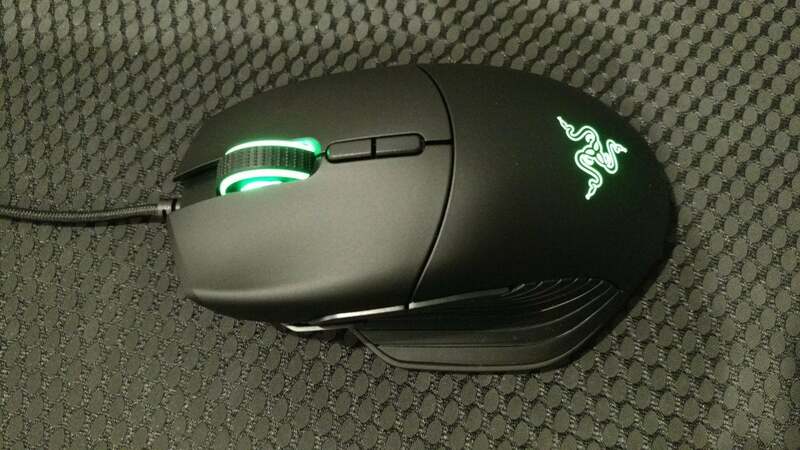 Meet the Basilisk, Razer’s new FPS-oriented mouse and (apparently) a DeathAdder competitor. Talk about being thrown to the wolves. The Basilisk is a brand-new design for Razer, and substantially so. With an enormous thumb-rest sticking off the side, there’s not a single other mouse like it in Razer’s repertoire. Not that Razer’s deviated that far from the basics. It’s still jet-black, with a “Chroma” RGB-lit logo on the back and rubberized grips on both sides. I’m not a huge fan of the rubber on the thumb-rest, as far as aesthetics go—the horizontal lines are a bit odd looking, and much more visible given the shape of this mouse versus, say, the Mamba. It also picks up tons of dust on the thumb rest. Looks aside, the thumb rest is extremely comfortable. Not only do I generally enjoy thumb rests, but the Basilisk’s rubber gives your knuckle a bit of padding. 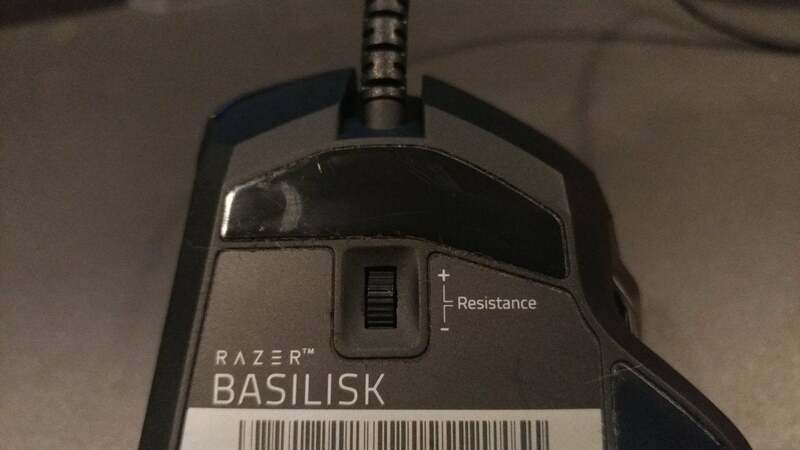 The thumb region also plays host to the Basilisk’s tentpole feature: A “clutch.” Plenty of mice featured a Sniper button in the past—Corsair’s M65, Logitech’s G502, and so on. The key word: Sniper button. 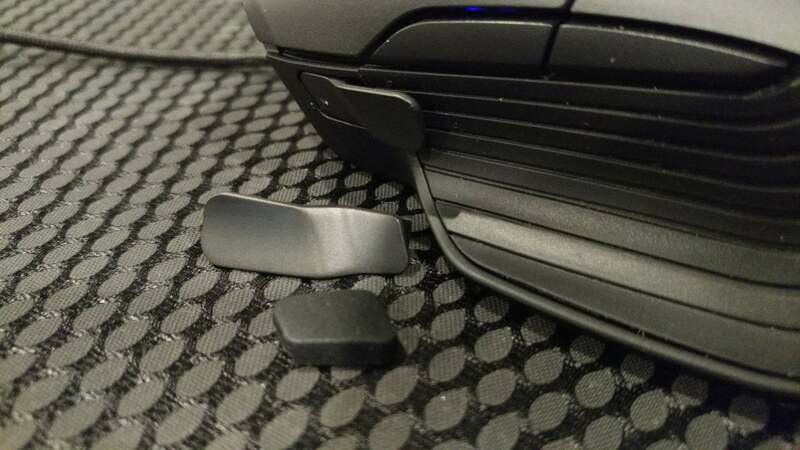 Razer has instead opted for a sort-of metal lever protruding from the side of the mouse. It’s functionally the same. You press the lever and it lowers the DPI (or whatever you’ve programmed it to do). The unique shape has twofold advantages though. First, it’s easier to reach. The Basilisk ships with both a long and short lever, either of which can attach to the side magnetically. This allows you to adjust the position of the lever closer to or further away from your thumb, whereas a button is embedded. There’s also less resistance. It’s a lever, and all the physical properties of levers apply here. Not only is a light press enough to activate the clutch, but it’s much easier to keep active while moving the mouse around. It’s a smart design. Groundbreaking? No. As I said, Sniper buttons have abounded for years, and (anecdotally) are rarely useful. But it’s one of those small quality-of-life changes that might make someone more likely to actually use the clutch where they might not have used one of its clunkier predecessors. You can also remove the clutch entirely and replace it with a small piece of plastic if you’d rather stick to a traditional two-button design on the side. The other noteworthy feature on the Basilisk is a resistance dial for the mouse wheel. Other companies have experimented with modular wheels lately—Logitech in particular, with its dual-mode endless scroll/clunky scroll wheel. The Basilisk lets you go from near-endless to clunky and everything in between. Flip the mouse over and you’ll spot a small roller labeled “Resistance.” Roll it up for a heavier, clunkier feel and down for a lighter, smooth scroll. It’s a neat feature, though I don’t think it works as well as the clutch (or existing scroll wheels). Even at lowest resistance you can’t quite reach a completely smooth scroll, but the clunkier scroll settings don’t feel as precise as you’d get from a wheel built with heavy scrolling in mind. The Basilisk feels temperamental, sometimes scrolling more or less than I thought, or not functioning as seamlessly as I’d expect. The rest of the Basilisk is pretty standard—Left Click with a fairly substantial divot in the center (same as the DeathAdder), Right Click, Middle Click/Scroll, plus the two thumb buttons and the clutch on the side. One aspect that’s very non-standard though: The drop-off on the right side. It’s the last feature I think might undermine the Basilisk, though it’s grown on me personally. Most mice are rounded off on the right side for ergonomic reasons. The Basilisk ends abruptly, almost vertically. 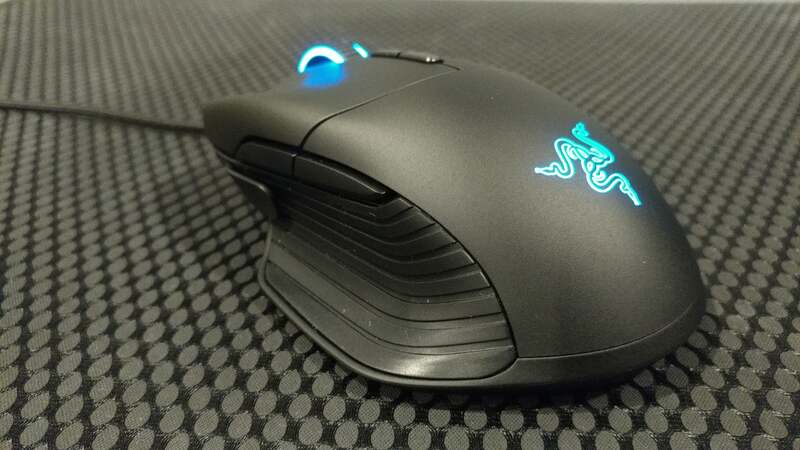 Given that the mouse already weighs 107 grams (right on the cusp of heavy for an FPS-centric mouse) I imagine Razer chopped off the right side to save some weight. The resulting shape takes some getting used to though. It’s not as ergonomic as you’d hope, especially if you’re coming from the DeathAdder. 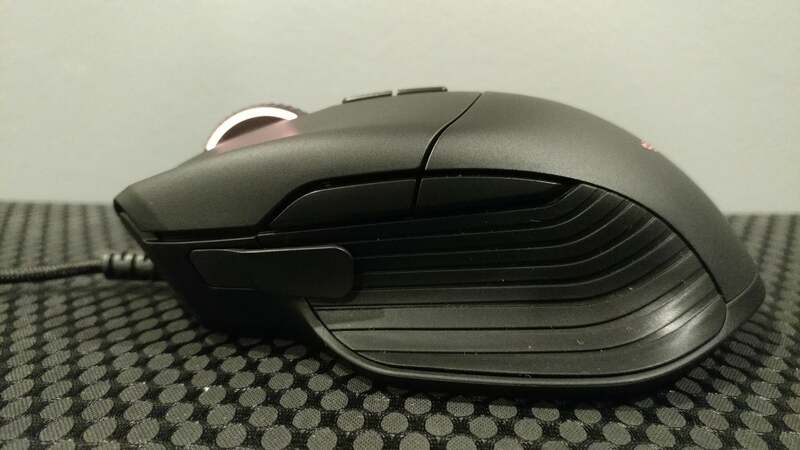 I like it as a claw gripper, but palm grips are harder to maintain without awkwardly resting your ring finger on the edge of the right mouse button or doing a three-finger (left, middle, right) mouse grip. As far as internal components go, the Basilisk and DeathAdder might as well be one and the same. Both feature the same “Razer 5G” optical sensor, which when the mouse is cracked open is revealed to be a PWM3389—probably Razer’s take on the beloved 3360/3366 in most modern mice. The biggest difference is that Razer supports up to 16,000 DPI instead of 12,000 like the 3360, but both are overkill for basically anyone, and higher DPI settings on the Basilisk introduce quite a bit of smoothing. That said, at normal-person DPI levels I haven’t had any trouble with the Basilisk, no judder or liftoff issues, and I guess it’s better to have the DPI headroom than to run out. Point being though: If you already own a current (say, post-2013) DeathAdder, there’s no performance reason to change to a Basilisk. Both are good. 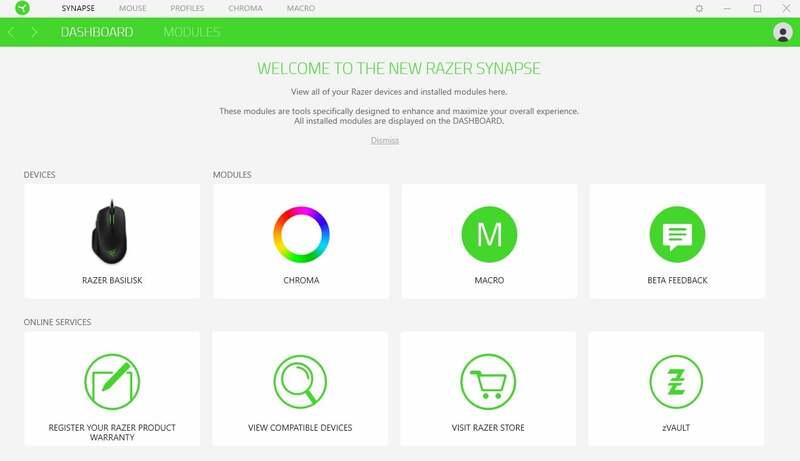 One final aspect that’s worth mentioning is that the Basilisk necessitates Razer’s new software, a refreshed version of Synapse. At first I was pretty excited—Synapse is a bit long in the tooth these days, and notoriously heavy considering it’s basically a utility to run your mouse’s lighting. It’s way more taxing on your system than you’d expect. The new Synapse (Synapse Remastered?) isn’t any better though. Coming in at a whopping 217MB install, I dare say Razer’s headed down the same path as Synapse, only with a new color scheme. And that color scheme is an eye-searing neon-green-on-white, which is a baffling choice. Green-on-black was a bit outmoded in 2017, but green-on-white is unreadable, which is worse. Colors aside the new design is a bit better though. The software’s laid out more intuitively, especially when it comes to switching between multiple Razer products. You can also store profiles on the Basilisk itself, so if you really hate it you can always fine-tune your settings and then jettison the software from your computer forever. That’s better than Synapse, for sure. If you don’t jettison Razer's app from your computer, be prepared for it to bug you all the time. Windows already abuses the lower-right corner of my screen for all sorts of unnecessary notifications, but Razer is even worse. Seems like every day there’s something Razer wants to call my attention to in Synapse, and I’ve taken to just blocking the notifications on a system level. 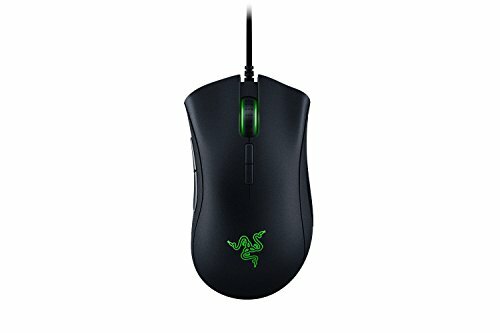 The Basilisk’s biggest issue is that, regardless of how Razer’s positioning, it’s a direct competitor for the DeathAdder a.k.a. one of the most popular mice in the world. And while the clutch is definitely a smart take on the Sniper button, it’s not enough to overcome the Basilisk’s other weaknesses: heavier weight, awkward ergonomics, and a temperamental scroll wheel. What I’d really like to see is a combination of the two—a DeathAdder with the clutch added on, for instance. But that would require Razer to fix what isn’t broken, and whether that’s worth it? Time will tell I guess. The Razer Basilisk's thumb clutch and unconventional shape are winners, but is it really a better FPS mouse than the DeathAdder? Probably not.